Carrie Hagen discusses her book. “We Is Got Him.” That’s what the first of 23 ransom letters said in which $20,000 was demanded in return for the kidnapped Charley Ross. But the two main suspects, William Mosher and Joseph Douglas. died within a year of the event, and the boy was never found. While his fate is still a mystery, 4-year-old Charley Ross has remained an important figure in Germantown’s history. Known as the first kidnapping for ransom in America, the event was highly sensationalized when it happened in 1874. 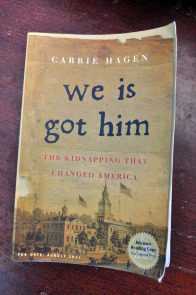 Author Carrie Hagen’s first book We Is Got Him, which will be published in August, recounts the famous story. Hagen said that her narrative offers new insight into the case and reinstates its significance to American history, and more specifically to Philadelphia’s history. While various aspects of the city contribute to her story, Hagen said that an important element and landmark to the story is City Hall, which was being constructed at the time of the kidnapping. July 4, 1874, which happened to be the day the first ransom letter arrived, also the same day the cornerstone of City Hall was laid. In order for the structure to better symbolize the city, Mayor William Stokley took some of the newspapers from that day and placed them into the cornerstone of City Hall. The story of the little boy being taken had been written up as a lost advertisement for the personal ads that day and was the first article published in the newspapers about Ross. But though Hagen has devoted the past six years to researching the Ross case and its significance to Philadelphia, it was not the original story about the city that she wanted to tell. Six years ago, Hagen entered the master’s program for nonfiction writing at Goucher College in Baltimore and needed an idea for her thesis. At the time, she was teaching high school English in Bucks County, so Hagen said she was looking for a story of local interest in Philadelphia. “I needed something that I could get my hands on around here and that I wouldn’t need to travel for,” Hagen said. Hagen said that she knew she wanted her story to relate to Germantown. Her father grew up in the neighborhood, and Hagen said she was always fascinated with stories from his childhood. “Trying to write my father’s story about why he left and wanting to get back in, that was part of the attraction for me,” she said. 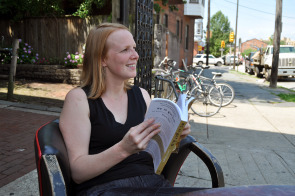 Originally, Hagen thought she wanted to investigate gentrification in the Northwestern parts of Philadelphia. But after learning of the Ross kidnapping, she said she found herself intrigued. Hagen said that the real story of kidnapping and much of what We Is Got Him covers is actually the flawed investigation of the crime, the motives behind someone kidnapping a child and the way a family can cope and concentrate on finding a child while dealing with grief. Hagen said that the greatest difficulty in writing narrative nonfiction is encountering points in history that still remain a mystery. Every piece of the story needs to be true and have a source, which Hagen said made it complicated to weave together certain parts of the story. Hagen said that she had to work with what she had and try her best to uncover as much relevant research and information as possible. She spent long amounts of time researching in the libraries at the Germantown Historical Society and the Chestnut Hill Historical Society. “It was really challenging, but at the same time that’s what ended up driving the book,” Hagen said. Hagen said that also focusing attention on the development of the police force at the time allowed her to fill some of the holes in history. Encompassing other elements of history gave her the ability to better execute the book as a narrative. Hagen said that the way she crafts the story captures the strong spirit of the city at the time, and though it is a story of the past, it still holds relevance to present-day Germantown. “I think that even though it’s a sad story, it’s something that really captures the zeitgeist of something that’s really still lingering in the cobblestones,” she said. This article was written and reported by Natasha Shapiro and Niambi McDonald for Philadelphia Neighborhoods, a publication of Temple University's Multimedia Urban Reporting Lab, and originally published on June 24, 2011.